Roy W. Gould is Simon Ramo Professor Emeritus, Division of Engineering and Applied Science, at California Institute of Technology (1955-present). Other institutional affiliations include Hughes Aircraft Company. His research interests include basic plasma physics and microwave electronics. April 25, 1927Birth, Los Angeles (Calif.). 1949Obtained BS in Electrical Engineering, California Institute of Technology, Pasadena (Calif.). 1950Obtained MS in Electrical Engineering, Stanford University, Stanford (Calif.). 1951 – 1952Research Engineer, Missile Guidance, Jet Propulsion Laboratory (U.S.). 1955 – presentAssociate Professor of Electrical Engineering (1955-1960); Professor of Electrical Engineering and Physics (1960-1974); Executive Officer, Applied Physics (1973-1979); Professor of Applied Physics (1974-1980); Chair, Division of Engineering and Applied Science (1979-1985); Simon Ramo Professor, Division of Engineering and Applied Science (1980-1996); and Simon Ramo Professor Emeritus, Division of Engineering and Applied Science (1996-present), California Institute of Technology, Pasadena (Calif.). 1956Obtained PhD in Physics, California Institute of Technology, Pasadena (Calif.). 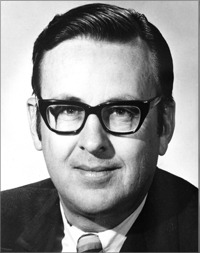 1970 – 1972Assistant Director of Research, Fusion, United States Atomic Energy Commission. 1994Awarded James Clerk Maxwell Prize for Plasma Physics, American Physical Society. Obtained BS (1949). Associate Professor of Electrical Engineering; Executive Officer, Applied Physics; Professor of Applied Physics; Chair, Division of Engineering and Applied Science; Simon Ramo Professor; and Simon Ramo Professor Emeritus. Obtained PhD in Physics (1956). Professor of Physics. Assistant Director of Research, Fusion. Received 1994 James Clerk Maxwell Prize for Plasma Physics. Oral history interview with Roy Gould, 1996 1 March-10 April. Joan Bromberg research materials for "Fusion: science, politics, and the invention of a new energy source", 1922-1982 (bulk 1958-1978). Oral history interview with Amnon Yariv, 1999 November 17, 24 and December 1.